This deluxe Panda bear costume has a large polyester top with black, felt-like sleeves and chest and a white fur material on the chest and back. The sleeves cover all the way to the tips of the fingers with an opening on the bottom for easy access to your hands. The tops of the hands have a patch of glossy black fur and shiny black claw accents. The waist of the shirt is elastic as is the waist of the included polyester black pants. 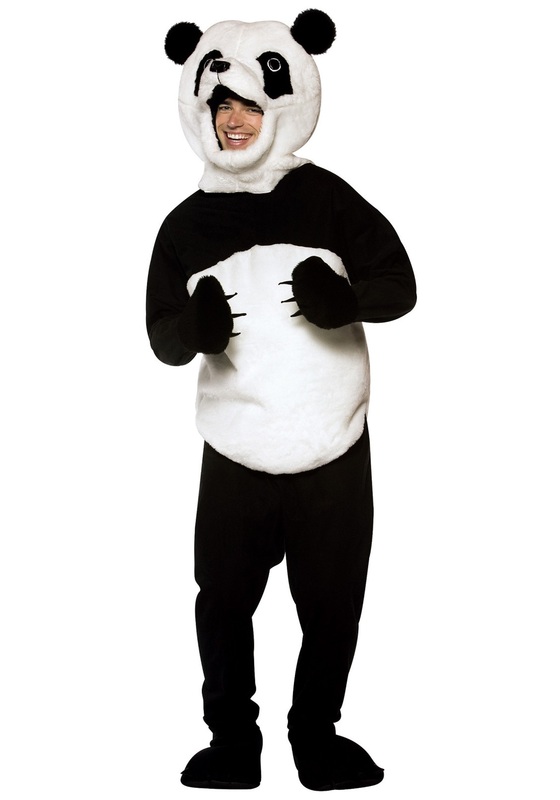 The included plush black and white panda hood has large black eyes, black ears, and a white snout with a shiny black nose. There is a large opening below the snout for your face and the top of the hood is designed to be stuffed for a full appearance. The oversized black poly foam shoe covers are designed to resemble paws with shiny black claws at the toes and they have elastic around the ankles and elastic underneath to hold them in place.